Daddy’s car says servicing BMW/Benz/Mini! What is a Benz? Woof! Daddy says it is a nickname for Mercedes-Benz. Did you know that your Mercedes ABS brake system consists of a control unit, pump, relay, and speed sensors. It is a very reliable system that can give you years of trouble free service. Woof! The pulsation you feel in the pedal is from the anti-lock brake system detecting a wheel lock up condition and pulsating the fluid to the front calipers to correct the lock up condition. If this pulsation is occurring on gentle braking, when the wheels are not in fact locked up, the culprit is usually the front ABS sensors. If you are noticing problems, bring your Mercedes to Lone Star Bavarian and we can service it for you! In the meantime, there are a few steps you can take to keep your brakes trouble free. Make sure you change your brake fluid at recommended intervals. Clean your front Mercedes ABS brake sensors when you have your wheels off and are replacing your brakes and rotors. Check the wiring from the front ABS sensors to where it connects to the harness underneath the hood. If you continue to have the pedal pulsating problem after cleaning the front ABS sensors it may be time to replace them. Woof! 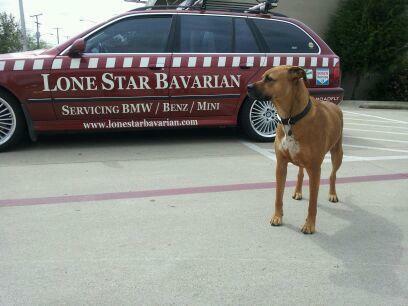 I hope to see you at Lone Star Bavarian for your next checkup!